The Zero Waste International Alliance established global standards to define and guide the development of ero waste initiatives. In a two-part series this week, Waste360 takes a look at zero waste and some of the actions industry professionals are taking to achieve zero waste. Read part two here. “Zero waste” has become a common phrase in the solid waste management space. Still, not everyone agrees on exactly what it is, or how to get there. Further, as the zero waste movement gains traction, so do various waste-to-energy (WTE) technologies. So, without definitions and terms accepted by everyone, it’s hard to definitively determine if “zero waste” and “waste-to-energy” can co-exist. But a growing number of stakeholders who call themselves zero waste advocates rely on a peer-reviewed definition of the Zero Waste International Alliance (ZWIA). The nonprofit established global standards to guide the development of zero waste initiatives. Its definition is a bit long but basically calls zero waste a goal to guide people in changing their practices to cut waste and to design all materials to continually be used, ultimately eliminating waste and its toxicity. 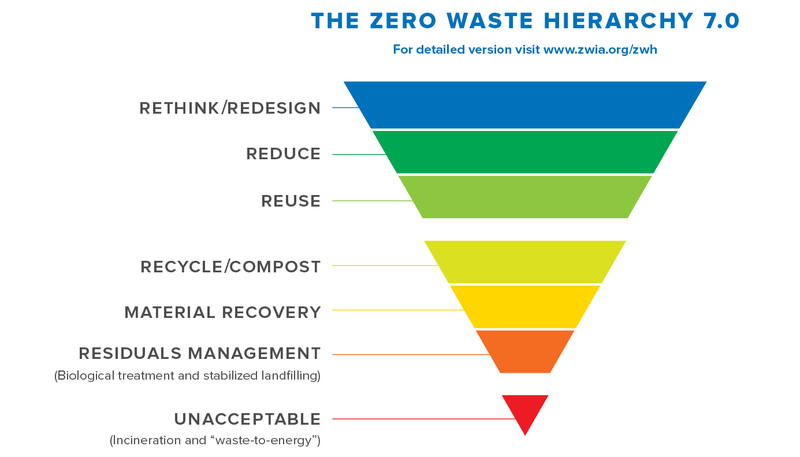 ZWIA’s zero waste hierarchy, in short form from top to bottom, is reduce, reuse, recycle, energy recovery and landfill. High-temperature conversion systems like incineration, gasification and pyrolysis don’t count as energy recovery. Compost and anaerobic digestion fit into the model, but that’s where the organization draws the line. National Recycling Coalition, Zero Waste USA and Green Business Certification Inc. are among organizations that adopted ZWIA’s standards. Dan Matsch, director of compost and the center for hard to recycle materials for Boulder, Colo.-based Eco-Cycle, believes conversion technologies are counterintuitive to zero waste efforts. Matsch thinks most recyclers have the same perspective—that WTE processes do not put valuable materials to their highest and best use. With AD, the reasoning is that this process extracts a certain amount of energy from digested waste but utilizes the remaining organic matter. “[Anaerobic digestion] can be beneficial in that once you have drawn the energy to make methane, you still have digestate you can use as fertilizer or compost feedstock,” says Matsch. Mike Ewall, executive director of Energy Justice, further explains—and has a belief about—which process should come first. Michael Thoreaux, vice president of JDMT, a Cheyenne Wyo.-based environmental and engineering consulting firm, invests in systems leveraging waste to make renewable energy and fuels. He points to different takes on what systems might fit in with zero waste. Whether there’s a fit basically depends on how you define energy recovery, he says. One example Thoreaux points to is a process involving vaporizing waste plastic and distilling that vapor into its molecular components to recover compounds to make fuels and other commodities. He says how “clean” many of the technologies are depends largely on how efficiently the process is done. So, how do you determine highest and best use? What counts as clean, sustainable energy conversion? And are these approaches fair game on the way to zero waste? It depends on who’s asked the questions, though it seems environmentalists and a lot of recyclers believe that not many WTE technologies fit into the scheme.